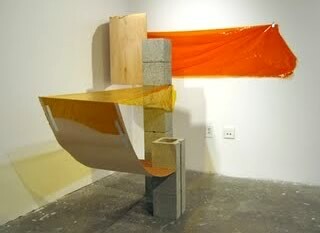 In one sense, San Franciscan artist Mitzi Pederson's use of unconventional materials including cellophane, aluminium tape, silver leaf or glitter reflects the eclecticism of fellow US sculptors such as Rachel Harrison or Darren Bader; in another, her frequent recourse to found items - wood, veneer, breeze-block and other industrial off-casts - is reminiscent of the 'unmonumental' interventions of artists such as Gedi Sibony. 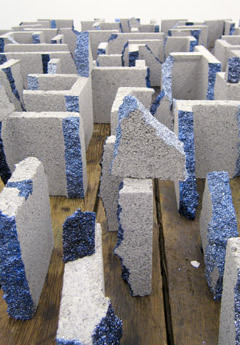 Yet Pederson's practice is very much her own, characterised by an unusually trenchant interest in the physical properties of her chosen mediums. 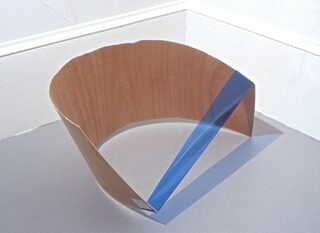 This concern frequently involves compositional arrangements in which the resilience of materials are pushed to extremes: slivers of wood panelling are curved into arcs, then held in place by taut strips of cellophane; blocks of wood are stacked into treacherous towers; a chunk of breeze-block is improbably suspended on thin string. In fact, many of Pederson's works are quite literally latent with pent-up energy, their apparent potential to spring apart or otherwise collapse at any moment a disquieting caveat to their essentially low-key appearance.